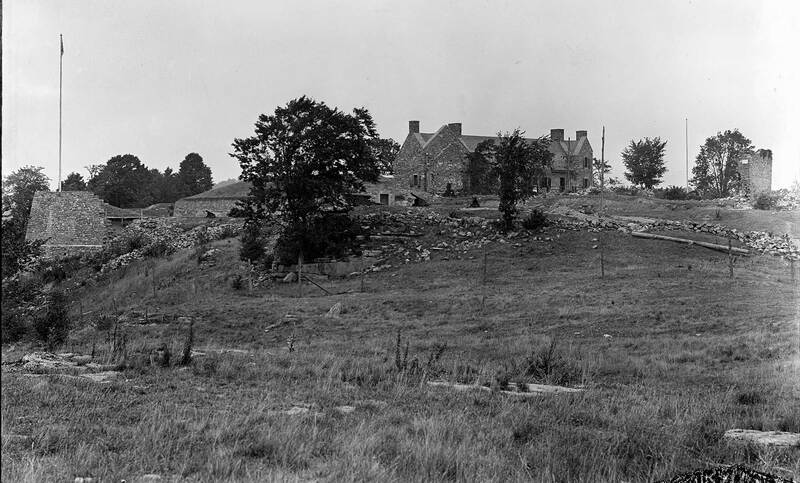 On May 10, 1765 a group of almost one hundred fifty Connecticut and Massachusetts men led by Col. Ethan Allen and Col. Seth Warner (both with ties to Woodbury), and Allen’s Green Mountain Boys captured the fort at Ticonderoga, north of Lake George (near Lake Champlain), in New York. They had been ordered to retrieve supplies for the fight in Boston. Colonel Benedict Arnold had joined them the day before. Two days later Crown Point (eight miles north of Ticonderoga on Lake Champlain), fell to Capt. Seth Warner and 100 Green Mountain Boys. One hundred eleven cannons were captured from the British. The important Lake Champlain waterway was now under the control of the Americans. Twenty-nine of the cannons were transported to Boston to help defend the Boston Harbor. A total of a thousand men from Connecticut, were sent under the command of Col. Benjamin Hinman of Woodbury to garrison (guard) the forts of Ticonderoga and Crown Point. Col. Benjamin Hinman, who fought in the French-Indian War, was commissioned Colonel of the Fourth Regiment of enlisted troops to defend the Colony. In 1757 David and Gideon Hickok had marched to Fort William Henry at the south end of Lake George (forty miles southwest of Ticonderoga), during a skirmish of the French-Indian War. Now brothers Asa and Reuben Hickok marched north with Col. Benjamin Hinman and the Woodbury men to secure Fort Ticonderoga and Crown Point. Asa Hickok’s daughter Hannah Hickok Eldred will be the mother of Mary Ann Eldred Austin. David Hickok’s daughter Hannah Hickok Smith will be the mother of five daughters. We’ll meet Asa Hickok on his way to Fort Ticonderoga in the next post. As Asa and Reuben marched northwest to New York, the Battle of Bunker Hill took place in Boston, on June 17, 1775. This entry was posted in ALAMA, Revolutionary War. Bookmark the permalink.